It is made up of four synths that can be used individually, or can be combined to play simultaneously. All individual parameters in each synth section can be MIDI control assigned, and a select number of them can be set to be randomized (the randomized parameters can be triggered either from their own specific synth section, or from the master section which will trigger all selected randomized parameters across all chosen synths). The user has the ability to record sounds and performances, and save up to 32 created presets. In the TONE GENERATOR synth, an ADSR envelope is chosen or made to shape the triggered sound. (In addition to the factory ADSR envelope presets, users can create and save up to 9 of their own). The sound of the TONE GENERATOR is made up of four oscillators, which can be mixed together as desired, and further tweaked by adjusting the ’TIME’, ’SPEED’, and ’TONE’ sliders. There are also modulating parameters that can be mixed in with the dry sound (CM RATIO and MOD INDEX), and a frequency sweep option as well. The parameters with the ‘shuffle’ button next to them can be randomized when they are selected and triggered by clicking the ‘DICE’ button. 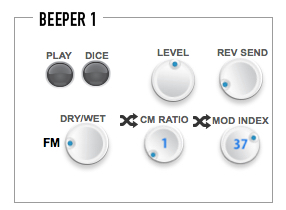 In the ‘Beepers’ section, there are two ‘BEEPER’ synths (BEEPER 1 and BEEPER 2). In ‘BEEPER 1’, the ‘PLAY’ button triggers a randomly selected beep sound. This sound can be changed by clicking the ‘DICE’ button, which will play random different dry beep sounds Two frequency modulating parameters can also be tweaked and mixed into the original beep sound. These parameters can also be set to be randomized, triggered by the ‘DICE’ button. 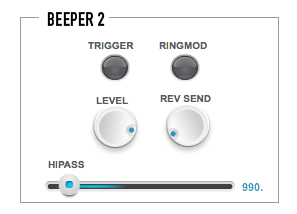 In ‘BEEPER 2’, the ’TRIGGER’ button creates random beep sounds, and a ring modulator can be added with the ‘RINGMOD’ button / effect selected. The ‘FM SYNTH’ gives you control over the frequency modulation parameters in both the left and right channels. An ADSR envelope can be chosen or created and / or saved (users can save up to 8 created presets). There are also two delays that can be added to the dry sound, with individual time and feedback parameters for the left and right channels. ***NOTE: each synth section has a reverb send with the master reverb parameter control in the master section. Know of any other cool features from The Galactic Assistant? let us know in the comments!